Oklahoma is currently experiencing a higher than normal number of confirmed positive rabid animal cases, including seven rabid dog cases this year, as well as a number of horses, cattle, goats, a fox and 30+ cases of rabies in skunks. Rabies is a viral disease of mammals that causes encephalitis (inflammation of the brain) and is nearly 100% fatal once the virus enters the brain. It is spread primarily through the bite of an infected animal. The virus advances slowly via the nervous system from the site of the bite to the brain of the bite victim. Less common routes of exposure include the exposure of cuts in the skin or mucus membranes of the eyes, nose, or mouth to saliva, brain, or spinal fluid of an infected animal. Rabies cannot be spread through scratching or contact with blood, urine, vomit, feces, etc. of an infected animal. 1) Wash all bite wounds immediately with soap and water, and continue washing for at least ten minutes. 2) Contact your healthcare provider as soon as possible. Animal bite wounds contain bacteria, so a tetanus booster and/or antibiotics may be needed. 3) If possible, safely catch or restrain the animal. Your local animal control or sheriff may be of assistance. Or, if the animal has an owner, get information about the animal’s history of rabies vaccination and contact information about the owner. 4) Call the local county health department sanitarian to report animal bites. The sanitarian will help confirm the animal’s condition and rabies vaccine status. 5) If a rodent or rabbit caused the bite, these are very low risk and rabies post-exposure vaccination (of the bite victim) is usually not recommended. -If the biting animal was a dog, cat or ferret (not owned by the victim and not currently vaccinated by a licensed veterinarian), the animal should be quarantined with a licensed veterinarian for ten days. -Dogs, cats and ferrets (not owned by the bite victim and currently vaccinated by a licensed veterinarian) may be allowed to be quarantined by the animal owner. -If the biting dog, cat or ferret dies or is euthanized during the ten-day quarantine, it should be tested for rabies. 6) If the dog, cat or ferret remains healthy after ten days, it was not infectious with rabies at the time the bite occurred. 7) If another species of animal caused the bite, the local county health department sanitarian should be contacted. More information is available at the Oklahoma State Department of Health website. Of particular interest may be subjects such as: What to do if you pet is bitten by another animal? ; What if the bite is on the face, neck or head? What about bats? Bites from a bat may be unnoticed, as the bat’s teeth are extremely small. Your local health department sanitarian can guide you in determining your rabies risk from an encounter with a bat. The best protection is vaccination of our pets and livestock. Oklahoma state law requires that all dogs, cats and ferrets be immunized against rabies by or under the supervision of a veterinarian by the age of four months. It is also recommended that horses and other valuable livestock be vaccinated against rabies. 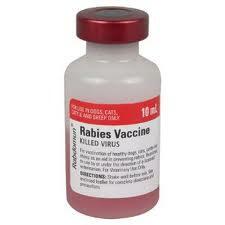 Only rabies vaccines given by a licensed veterinarian are recognized by the health department. Please call your veterinarian to schedule your pet’s immunizations.